Is your little one's bottom red and painful? It might be the sign of a cloth diaper rash, a skin irritation in babies. Find out what causes rashes and how to prevent them when using cloth diapers. Diaper rashes are a sign of skin irritation in babies. 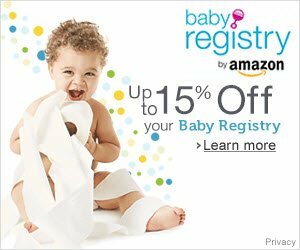 They may appear as redness, blisters, pimples or other sores on your baby's bottom. Can I Prevent Diaper Rash? Diaper rashes can occur if baby's skin is in contact with wet or dirty diapers for a long time. Frequent diaper changes are the easiest and most effective way to prevent diaper rash. For healthier babies, newborns should be checked for wetness every 60 to 90 minutes. Older babies will generally feel damp after 2 to 4 hours of wearing a cloth diaper. To prevent rashes with cloth diapers, you baby will need to be changed more frequently since cloth diapers are sometimes less absorbent than disposables. There is really no evidence to suggest that either cloth or disposable diapers cause more rashes than the other. Soap, fragranced wipes, detergents, and other baby products can irritate your baby's skin. To avoid diaper rash, the American Academy of Family Physicians suggest using plain warm water with or without a very mild soap to clean your baby's bottom. They also recommend that you allow baby's skin to dry completely before putting on another diaper. You should also try to avoid scented soaps and baby wipes that contain alcohol or perfumes, since chemicals can irritate your baby's skin. Diaper rash can occur if your baby's diaper is too tight or if it rubs against baby's skin. If your baby gets a cloth diaper rash, you may want to experiment with other types of laundry detergent. For more information on laundry detergents for cloth diapers, read our article on how to wash cloth diapers. No matter what type of laundry detergent you use, it is important to rinse your diapers well. If soap residue remains in your diaper, it reacts with urine to create ammonia, which can cause cloth diaper rash. In our front-load washer, I run our cloth diapers through an extra rinse cycle to make sure all of the soap has rinsed out. While natural fibers (cotton, hemp, bamboo) can be placed directly up against your baby's skin, microfiber can dry out baby's skin and cause irritation. You should only use microfiber in pocket diapers and other styles of diapers that use a stay-dry barrier (such as fleece) between the absorbent layer and your baby's bottom. Some babies are also just plain sensitive to wetness. 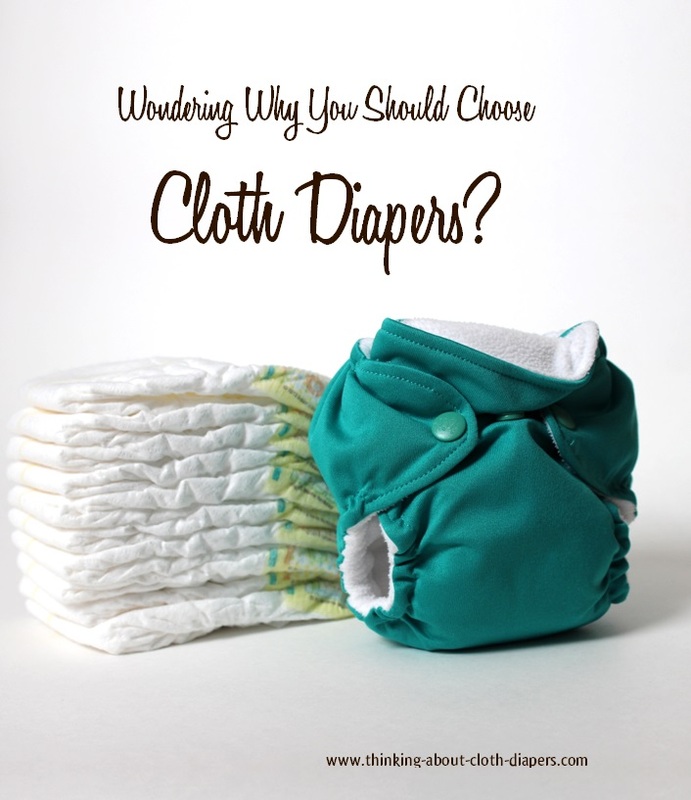 If you find your baby is one of them, you may want to select cloth diapers that use a stay-dry layer such as fleece, suedecloth, or athletic wicking jersey to wick moisture into the absorbent material and keep it away from your baby's sensitive skin. If your diapers don't already have a stay-dry layer (like pocket diapers) and you don't want to buy new cloth diapers, another option is to purchase or make stay-dry liners to lay inside your diapers. These are rectangular pieces of fleece that you lay on top of prefolds or other natural diaper fabrics that act in the same way as a stay-dry layer would. What if My Baby Gets a Cloth Diaper Rash? In many cases, diaper rash creams will clean up most early signs of redness. If you're brave, you can also let your baby go without a diaper to expose your baby's bottom to air. Also, be sure to consult with your family doctor or pediatrician to rule out a yeast infection. If you are using cloth diapers, you will want to consider a rash cream that is safe for cloth diapers. Diaper rash products and Vaseline affect the absorbency of your diapers since they build up in the fabric over time. 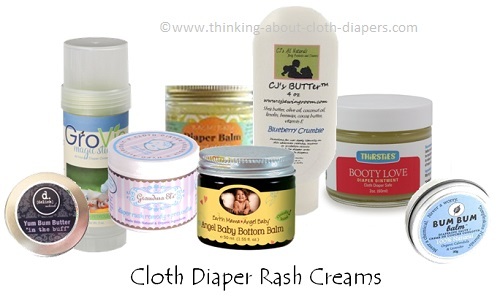 Several brands, including Grandma El's and CJ's BUTTer, and many others (some are pictured below), manufacture natural diaper rash creams that do not hurt your cloth diapers. Many of our Facebook fans also swear by coconut oil (which can be used as a solid or a liquid) as a fast-healing option for diaper rashes and other minor skin irritations. 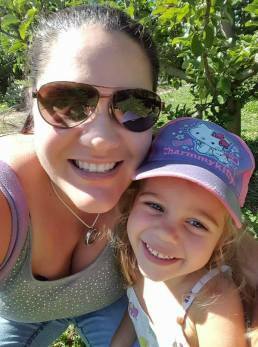 If you're looking to purchase cloth diaper rash creams, check out Nicki's Diapers for a huge selection. For Canadians, Lagoon Baby carries a wide selection of brands. If you want to use a zinc-based diaper rash cream (ex: Aveeno, Penatan, Desitin), we recommend adding a fleece liner between the cream and your baby's bottom. This will protect your diaper from creams or materials you might use, since zinc-based diaper rash creams are hard to wash out! Babies may be sensitive to perfumes and other materials in disposable diapers and wipes. With disposable diapers, polyacrylate absorbent material is added to wood pulp to increase absorbency. When mixed with liquid, this material turns into the familiar gel you notice when the diaper is wet. This material works to draw wetness away from the skin. Because of the absorbent nature of the wood pulp and polyacrylate absorbent material, your baby might not be able to feel the wetness. Disposable diapers should still be changed as frequently as cloth diapers! Since heat and moisture breed bacteria, disposables still need to be changed frequently to keep baby's bottom cool and prevent rash. If you are worried about the chemicals found in disposable diapers, click here to read Eco-Friendly Diapers for more information on dioxin and sodium polyacrylate. Disclaimer: All information provided in this article is provided for general information purposes only, and does not address individual circumstances or medical needs. This information should not be considered a substitute for evaluation by a doctor or pediatrician to address individual medical needs. Thinking-About-Cloth-Diapers.com does not provide medical advice or treatment. Always consult your doctor for medical advice. This article contains some affiliate links. I am disclosing this in accordance with the Federal Trade Commission’s 16 CFR, Part 255: “Guides Concerning the Use of Endorsements and Testimonials in Advertising.” For more information, see our Disclaimer and Copyright. Go back to Cloth Diapers vs. Disposables.